Synopsis: Are you ready to look at adult ADHD in a completely different way? Transforming ADHD offers a radical, breakthrough approach based in attention regulation and interpersonal neurobiology (IPNB) to help you gain focus and freedom from your symptoms. Adult attention deficit/hyperactivity disorder (ADHD) can make even simple everyday tasks—like paying bills or getting groceries—extremely difficult. At the end of the day, you may feel unfocused, and life may seem unmanageable. However, this struggle isn’t the result of an inability to pay attention, as is so widely believed. Studies now show that ADHD results from an inability to maintain attentiveness. Adults with ADHD can and often do focus on things they enjoy, but have trouble focusing on things that aren’t as interesting to them. More and more, experts are acknowledging that, rather than a deficit of attention, ADHD is really about adjusting attention between hyperfocusing and underfocusing. 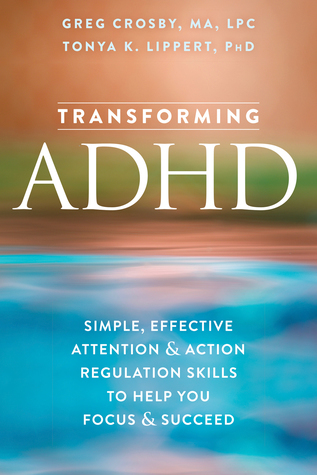 Transforming ADHD draws on psychology, biology, neuroscience, sociology, and other disciplines to provide an innovative guide for learning how to better regulate your attention. Looking at ADHD through the framework of IPNB—a model that see’s one’s mind, brain, body, and relationships as intimately connected—you’ll discover how to rewire your brain for better attention regulation and overall well-being. With the research-based exercises, tools, and techniques in this book, you’ll learn how to effectively manage your attention so you can focus on what it is you need to do—and do it well. Greg Crosby, MA, LPC, is a practicing therapist and college and graduate school instructor. In 1994, he started the first adult attention deficit/hyperactivity disorder (ADHD) group for the Kaiser Permanente Northwest Region, and has been working with the Oregon Attorney Assistance Program providing ADHD workshops since 2013. Crosby is a certified group psychotherapist and group psychotherapy fellow. He teaches adult ADHD classes at Portland State University and Marylhurst University. Crosby offers workshops on ADHD for professionals, and has a private practice where he works with adults diagnosed with ADHD. Tonya K. Lippert, PhD, works for Kaiser Permanente’s mental health and social work departments, where, among other duties, she leads adult attention deficit/hyperactivity disorder (ADHD) groups. Lippert has written several research articles, as well as children’s books during her free time. She also knows what it’s like to live with ADHD up close thanks to her spouse and one of her children (both of whom generously shared experiences and contributed ideas for the book). Review: I've struggled with ADHD since I was a kid. My parents refused to put me on medication, and in college the medication didn't interact well with my anti-depressants and anti-anxiety meds so I was taken back off of it. This gives me a medication free way to cope with the ADHD that doesn't involve ingesting copious amounts of caffeine to cope.